Two new Russian-made Su-30MK2 fighter for Vietnamese Air Force, has been disassembled for shipping to Vietnam on 6/8. Sukhoi factory Komsomolsk-on-Amur has officially provide 2 multirole fighters Su-30MK2 to Vietnamese Air Force. 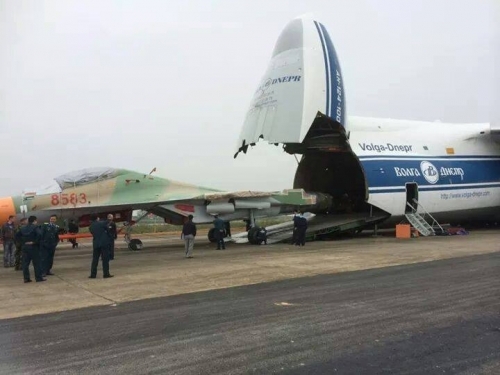 Interfax-AVN citing sources in the Russian aviation industry said Thursday 7/8, two new Su-30MK2 multirole fighter, built for the Vietnamese Air Force with bearing numbers 8814 and 8815, has been disassembled and put up a super-heavy transport aircraft An-124-100 before traveling to Vietnam in the last Wednesday 6/8. Sources said, two Su-30MK2 here are 5th and 6th Russia handed over to Vietnam within the framework of a contract to supply 12 aircraft of this type which signed in August 2013. First 4 Su-30MK2 (bearing number 8581, 8582, 8583 and 8584) have been delivered to Vietnamese Air Force in October and December 2014. As planned earlier, Russia will continue deliver 6 remainder Su-30MK2 to Vietnam before the end of 2015, bringing the total number of advanced fighters of this type in the Vietnamese Air Force up to 36 units. Earlier, in 1/8, Vietnam Navy also held comissioning of 2 Kilo 636 submarines, named HQ Hai Phong 184 and HQ Khanh Hoa 185, bringing the total number of Kilo submarines in the Vietnamese Navy to 4 units. The new Kilo submarines, along with Su-30MK2 fighters will significantly enhance combat power for Navy and Air Force of Vietnam in combat readiness duty to defend its sovereignty, island of the country.